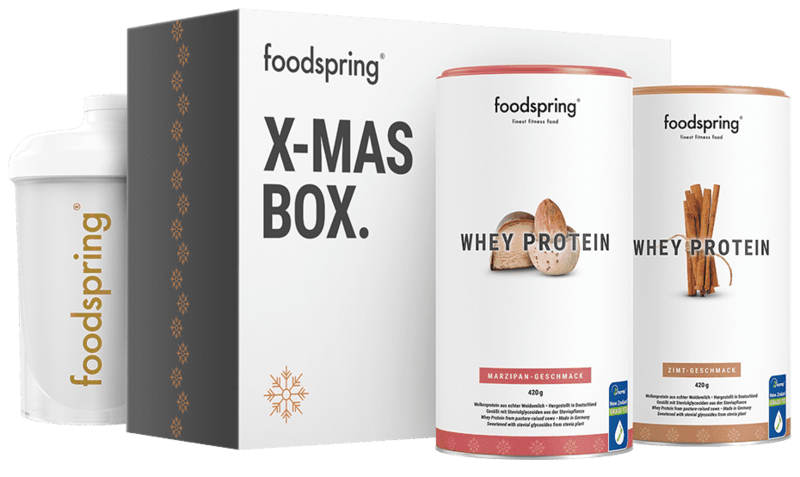 Cinnamon & marzipan shakes – only in the Christmas box! Christmas is for indulging. As much as you want. Create a creamy marzipan and cinnamon shake as your extra portion of protein. Sinfully delicious, but without any of the calories. Made with milk from pasture-raised cows. Comes with our glamorous gold shaker – only available in the Christmas box! The gift of fitness, for yourself or your loved ones. Tastes like Christmas. And goes straight to your muscles. Freshly baked cinnamon stars. Some lovely Christmas stollen enjoyed in front of the fire. You can enjoy a moment of weakness. But your muscles stay strong. Our whey shakes are a protein treat for after the gym or whenever you like. Naturally made with whey protein from real pasture milk. Fewer carbohydrates. Hardly any fat. But with full-flavoured goodness! Powder mixture made from whey protein concentrate and isolate for the preparation of protein drinks. Contains sweetener. 1 Calorific and nutritional values will differ where a base other than water is used. Mix 30 g (approx. 3 tablespoons) of whey protein with 300 ml water or low fat milk. Fill the shaker with liquid first, then add a serving of whey protein powder and shake well for 20–30 seconds. For best results, drink 1–3 portions a day immediately after exercising or first thing in the morning. The protein elements in whey are metabolised very quickly, which is why you should drink a shake straight after exercising. If you are interested in a complete muscle care package, you can also take 3K Protein in addition to your whey protein supplement. The advantage of this is that you can take whey protein in the morning or after exercising for a quick supply of nutrients. And you can take 3K Protein after an evening workout or before going to bed. The protein is released to your muscles more slowly, thanks to the casein content. This ensures that your muscles are supplied with nutrients and can repair themselves throughout the night, which in turn prevents the muscles from being broken down. Can I buy the Christmas shakes individually as well? The special Christmas editions are only available in the Christmas box. A great way to treat yourself if you want to enjoy Christmas fully and still want to keep an eye on your fitness. Or a great starter pack as a gift for your friends. Smart people don't wait for New Year's resolutions – they get started on their New Year's workout right now. Can I get the Christmas flavours in big tubs? We have packaged our delicious Christmas flavours in two practical small indulgence packs on purpose. As special treats. Depending on which Christmas treat you feel like. Because let's be honest: Even at Christmas, you want more than just cookies. What can I achieve by using whey protein? Whey protein is especially suited to muscle building and muscle maintenance for strength and endurance training. Whey protein is best used directly after physical exertion. Moreover, whey protein can be used to offset nutrient deficiencies caused by insufficient protein intake. What are the advantages of protein from pasture milk? Protein is the main ingredient in your shake. That's why we use only exceptionally high-quality ingredients. Milk from pasture-raised cows is our standard. That way, we ensure that only the best-quality milk gets into your shaker. Milk from grass-fed cows contains more linoleic acid and also has a higher omega-3 fatty acid content than milk from indoor cows. Would you like to know more about our pasture milk? You can discover where our milk comes from and the history of our protein here. Christmas Shake Gift Box will be back in stock shortly.